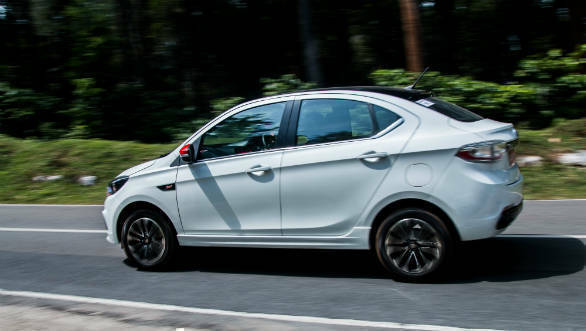 We've come away from driving the Tata Tiago JTp and tata Tigor JTP largely impressed. And this is not much of a surprise given the amount of work the team at JT SpecialVehicles has put into the two cars. Here are some of the highlights. The cars get a hood vent, new gloss black detailing on the front grille, new front bumpers with a larger lower grille and a rear bumper with a subtle diffuser. There are twin-pipe exhausts and JTP badging on the grille, the new fender vents and the rear. Other exterior styling changes include new dual projector headlamps first seen on the recent Tigor facelift, albeit with a chrome finish. There is also a new design for the diamond-cut alloys, new side skirts, contrasting black roof and rear spoiler and contrasting outside mirrors. All of these styling changes work well, more so in the Tiago JTP than in the Tigor JTP. They convey these cars' more focused attitude towards driver involvement. All the new bits are well put together, functional and never feel tacked on. The changes here are not as extensive as on the outside but whatever has been done works well. 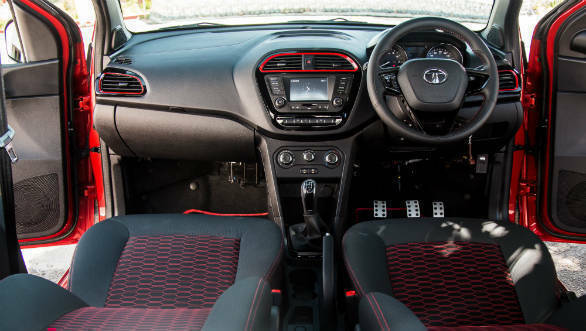 Both cars get an all-black interior with contrasting red accents, a new leather-wrapped steering wheel. The seat fabric is also new and gets red stitching, as does the gear shifter and steering wheel. There are also aluminium finish pedals. Both the Tiago and Tigor JTP get a new eight-speaker set up for the infotainment system, two airbags in the front and ABS is standard. The new steering wheel does help alleviate some of the standard car's woes with respect to driving position and feels nice to hold. The gear lever is nice to hold too, but the long throws are a bit of a downer. The seats come from the standard car and while comfortable, don't add anything to the driving experience. 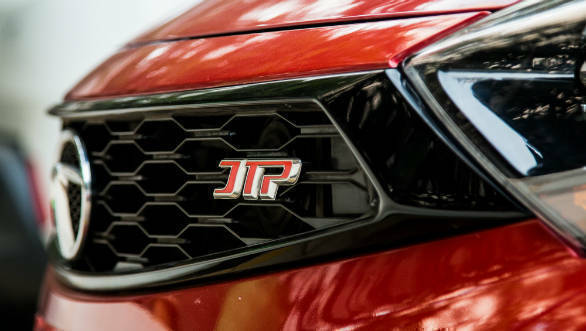 The JTP twins get a new 1.2-litre Revotron three-cylinder turbocharged petrol. 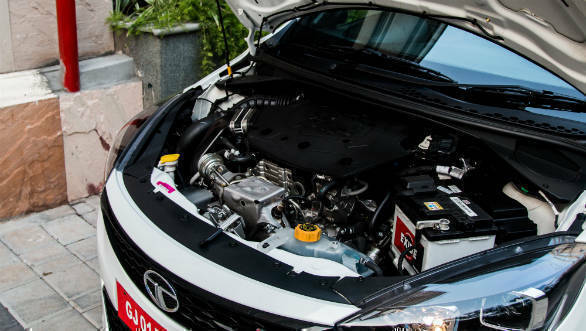 This is the petrol motor from the Nexon but JT Special Vehicles has tinkered with it. Both cars get this unit which puts out 114PS and 150 Nm. Against the 85PS/114 Nm of the standard cars, the performance bump comes by way of new intakes and exhaust systems. 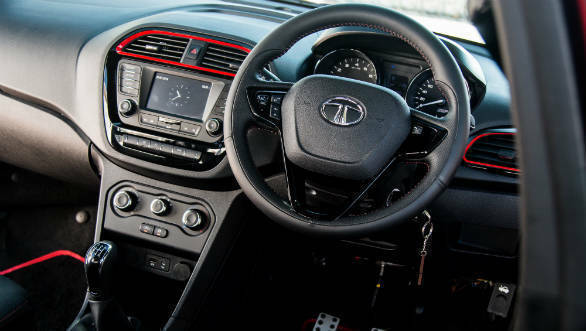 Tata Motors also says they have worked on optimising the five-speed manual transmission by shortening the ratios. Given these cars sporty bend, the eco mode has been deleted and city and sport drive modes are available. These changes work well in practice. The motor is very tractable, and turbo lag is not an issue. The shorter ratios always keep the engine in the meat of the powerband. 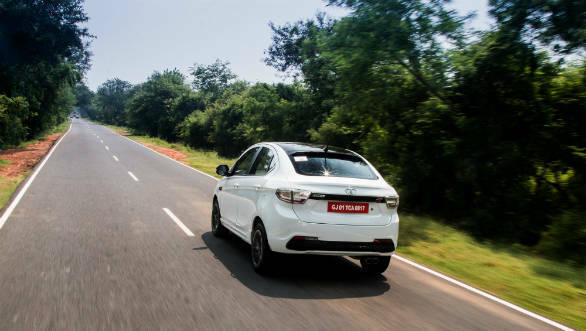 The engine revs to 5,500 rpm in city mode where torque is limited to 115Nm, this increases to 5,900 in Sport where the full 150 Nm is available. There is a noticeable bump in progress after the 3,500 rpm mark. JT Special Vehicles has worked on tuning the suspension, recalibrated the brakes and steering, There are also new grippier 185-section 15-inch tyres specifically developed for these cars. All of this has helped make the cars a good handler. The ride quality is good in urban conditions and the cars are also poised at highway speeds. Show them a section of twisties and the cars turns in well, stick to their line and understeer only at the limit. The new rubber provides impressive grip level. Feedback from the brakes is good and the steering is precise and well-weighted. 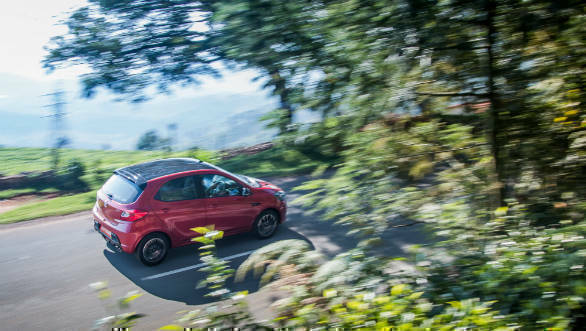 Minor drawbacks are the lack of disc brakes, a steering which doesn't weigh up adequately under load and there is some body roll when the car is shown a section of challenging curves. 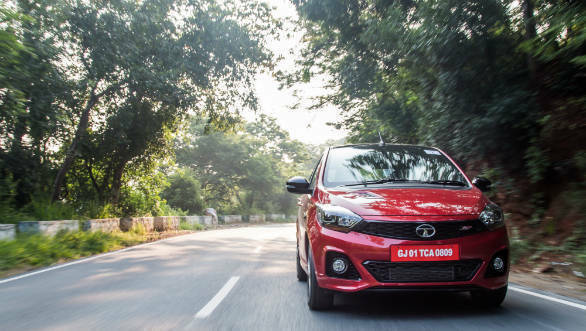 This is where the Tiago JTP and Tigor JTP score the most brownie points, they undercut the cars available in India, closet to them on paper and in what they offer to the driver, the Maruti Suzuki Baleno RS and the VW Polo GT TSI. The Tiago JTP is priced at Rs 6.39 lakh while the Tigor JTP, even with the sedan body style, will set you back by Rs 7.49 lakh. This is a whole Rs 89,000 less than the Baleno RS' Rs 8.38 lakh and a Rs 1.73 lakh less than the GT TSI's Rs 9.22 lakh. 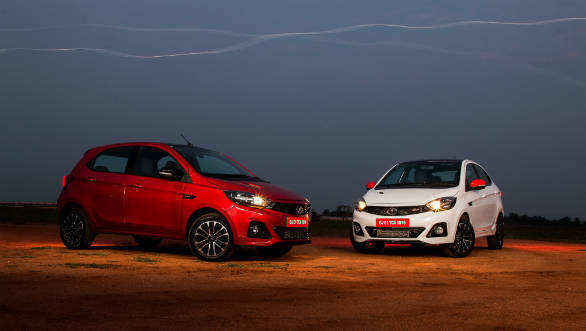 This difference increases further for the Tiago JTP to Rs 1.99 lakh and Rs 2.83 lakh for the RS and GT TSI respectively. All prices are ex-showroom Delhi.